The Buena Vista pours an exact 1 1/3 ounces of whiskey into its Irish Coffee. Tullamore D.E.W. 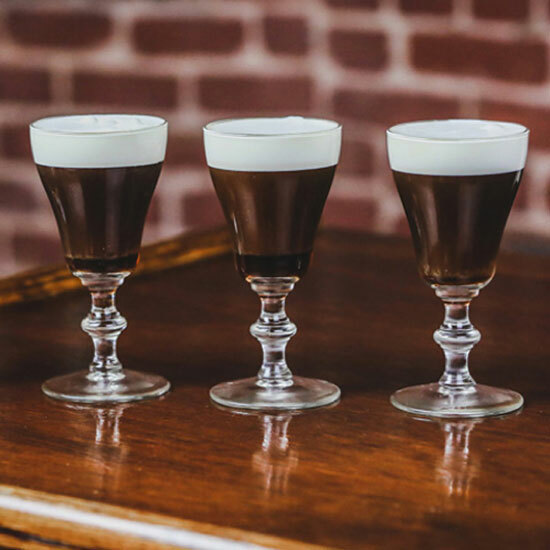 Irish Whiskey has been the dram of choice since the dawn of Irish Coffee. The original recipe called specifically for this smooth whiskey and deemed 1 1/3 ounces the perfect amount. Buena Vista follows these recommendations to this day. Pre-heat a 6-ounce, heatproof glass by filling with hot water. Once warm, empty the glass. Add two sugar cubes to the glass, then pour over coffee until the glass is 3/4 full. Stir thoroughly until the sugar is dissolved. Add 1 1/3 ounces of whiskey to the coffee. Float a layer of whipped cream over the top of the coffee by pouring gently over a spoon.